The LawPro Security Windbreaker protects you from chilly climates, with a nylon taffeta shell, drawstring waist and elastic cuffs. The brushed tricot lining on the shell helps preserve your body’s heat, while the drawstring waist and elastic cuffs prevent the entrance of bitter winds. Convenient pockets also keep your hands warm, with reinforced construction to cut down on the wear and tear that pockets often endure from frequent use. SECURITY letters are silkscreened on the back and on the front left chest. This Jacket would have be rated higher if, and that is a BIG IF, the lettering on the back did not peel away after a short time of use. Otherwise it is a great jacket. 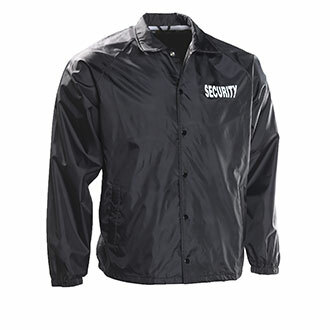 This inexpensive windbreaker is perfect for my warehouse security job. It covers my weapon, yet is not too long. It has a drawstring at the bottom and side pockets, also elastic cuffs. This jacket is minimal and will not really keep you warm, but it is roomy enough to accommodate several layers underneath. I ordered a large, and it fits me just fine. (I am 5'9" and weigh 205 lbs.) I gave it 4 stars because the jacket lining is very, very thin: too thin to qualify it as a true "windbreaker" in my opinion. But still, a good jacket for the money. I washed this for the first time, according to the instructions on the label. When it came out of the dryer, I saw that much of the "SECURITY" lettering had come off. Very disappointing. The label says that dry cleaning is also permitted, so maybe that method would not remove the lettering. I have to change my rating to one star. Eventually you will need to clean the jacket, and what good is it without the lettering? The jacket is way to short! I can't get the wrinkles out of it either!